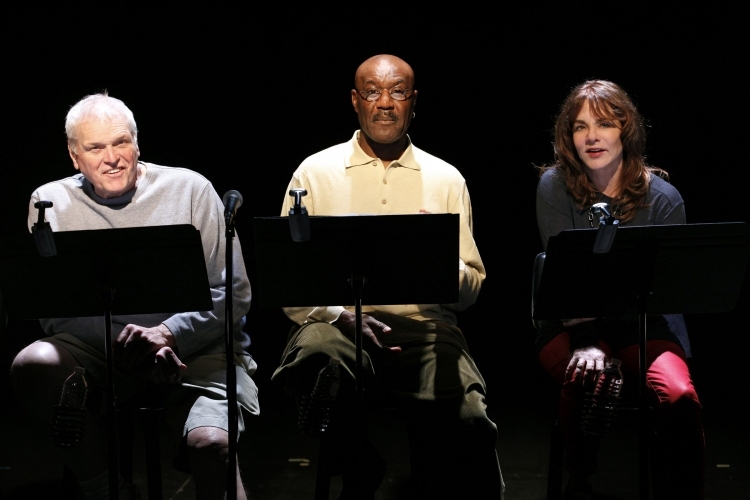 (L-R) Brian Dennehy, Delroy Lindo, Stockard Channing, among the opening night rotating cast members. Image by Carol Rosegg. Television and film and well-thumbed beach reads give us stories of citizens who were locked up by mistake, who received a raw deal at the hands of the law, who clamor for justice and in the end achieve resolution or revenge or a bit of both. Those stories on stage or on film or on the page can feel like a journey through legal minutiae and redemption in a “gotcha” moment — with the feeling that well-turned phrase or snappy presentation and the belief in silver-tongued lawyers to achieve the final act win. Those stories turn on the if-only-I-had-Perry-Mason-or-Spencer-Tracy-as-Henry-Drummond-standing-in-for-Clarence Darrow as my lawyer I could beat this thing sensibility. The Exonerated, in a 10th anniversary staged reading at the home of its original presentation (with the same director and with some of the same rotating and non-rotating cast), turns those familiar legal procedural expectations on their heads. We hear the stories of a number of real people who spent years on death row for crimes they didn’t commit, who were released through the procedural defense work of The Innocence Project. We learn little of the legal work behind these characters’ exonerations (that would be an entirely different play) and almost exclusively hear the life stories before and in and after imprisonment of the wrongfully convicted citizens. And the experience of this play, read solemnly, directed acutely, lit strategically, is aching and powerful and true. We hear the life stories of a number of death row residents who were later freed, primarily in monologue with a few exceptions. In this play carved out of transcripts and interviews by Jessica blank and Erik Jensen, we don’t blame systems but we worry about individuals who harm with agendas or individuals who don’t know to fight those who hold those agendas. The cop cutting corners or the judge who doesn’t listen or the person with the wrong politics (a hippie in Florida in the 1960s) or the wrong skin color (several black men in several places) or a gentle nature (an effeminate white man who informs us of a range of wrongs). Bob Balaban has returned to direct again, and he and lighting designer Tom Oniveros work wonders in a static and stark world. This play is well-crafted theatre with dramatic arcs and presenting people as characters we grow to know and care about. The work may never be staged fully, away from the music stands and stars (in the four person rotating cast) on book. And money is collected for the benefit of those exonerated, whose lives were disrupted at best and destroyed at worst, who lost sometimes decades of living on the outside with no financial recourse. In my performance cast Stockard Channing, Brian Dennehy, Delroy Lindon, and Chris Sarandon provided the star wattage, and Sunny Jacobs who was played by Channing graced us briefly on stage up from the audience.The stars in their jeans and workshirts provide some gloss; the script itself makes your heart ache. The genius of this script and these performances and the people whose lives are represented is that at the end of the legal devastation there is hope. Focusing on the life stories, there is hope. See this show. There is hope.